CORE GIS is located right on the edge of the Ballard neighborhood in Seattle. The non-profit Sustainable Ballard has been active in numerous sustainability and environmental issues, and each year at this time they ramp up their "Eat Local" campaign by promoting the 100 mile diet. This seems like a great idea, for a number of reasons--it supports local farmers and local economies, reduces fossil fuel consumption, builds community, and encourages all of us to think about where and how our food is grown. I decided to take this idea to its logical extreme--what if everyone in Seattle decided to follow the 100 mile diet? Do we have enough agricultural land to support that many people? I started with 2000 U.S. Census data, specifically the SF1 100% population count at the block group. Then I used 2001 NLCD land cover data and extracted the two agricultural classes--cultivated crops and hay/pasture. 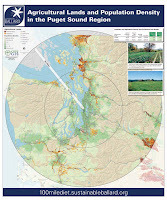 I arbitrarily chose a spot in the middle of Seattle, created 50 mile and 100 mile buffers, then counted up the number of people and the acres of agricultural land within the two distance bands. As it turns out there is far less acreage in cultivated crops than in hay/pasture, and within 50 miles, each acre of cultivated crops would need to feed 172 people! If we assume that all of the hay/pasture can be converted into cultivated crops, the number of people supported by one acre drops to 22. Moving out to 100 miles improves the situation, with just under 31 people per acre of cultivated crops and just under 7 per acre for all agricultural land. (The cartographic and tabular results are shown in the thumbnail image to the right; if you'd like to download a screen-resolution PDF of the 30"x36" poster, just click here. Please contact me if you'd like a printed version). However, according to one study, a meat-based diet requires 9 acres per person! A diet that is primarily plant-based (with some milk, cheese, and eggs) requires 3/4 of an acre. Clearly, we still have far too little agricultural land within our 100 mile radius to feed our entire population. This suggests to me that our region has a lot of thinking to do about our food security and food sovereignty. What happens if there are shortages of fossil fuels, in particular diesel, for transporting food across the vast distances it currently travels? Are there areas within our region that have prime agricultural soils that are not being cultivated? What policies can/should be put in place to ensure that we have the capacity to feed a much larger proportion of our population from local farms? How should our food distribution network change to make it easier and more efficient for local farmers to get their produce to market?